This newsletter, like many others across the city, is in constant need of support – financially and of volunteers. If you, or your business would like to support the newsletter, in any way you can, either by giving your time to delivery or by advertising, please contact us. mariannapaf@hotmail.com or contact us before the 28th of February ‘09. Send us pictures from our area. a legend in the next issue!! An application for full planning permission was submitted by Aldi on August 18th with full supporting documents. The planning committee will sit on November 17th 2008. Following the presentations made to the full Community Council and also to the SEARCH Group, the Futures Group met to consider how to respond to the application. There were three main strands to the discussion in the group. Clearly (and increasingly in these difficult times) a discount store with good quality and low prices would be welcome in the area. The location of the store is nearly 300 yards / 4 minutes walk from the centre of the existing shops and as Aldi will not stock newspapers, toiletries or cigarettes people will have to visit two areas on foot or by car / bus. The proposed building would have a significant impact by on the green area along Crow Lane. We need to ensure we enhance our green areas as they are a considerable value in our urban surroundings. It was clear that opposing the application on the grounds that the proposed store was in the wrong place could lead to eventual refusal and the loss of any discount store in Henbury and Brentry. Thus the Futures Group resolved that we should support the application but press for significant improvement in local transport in Brentry and Henbury funded by Aldi, who of course would benefit from more customers being able to get to their store. This was the substance of our formal response to the planning department about the application. We welcome your comments on this issue on the website. 65 people attended the Conference and a full report will be made available shortly. 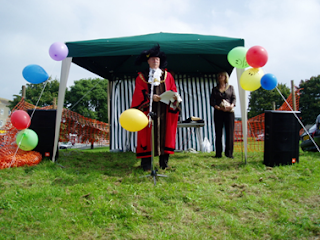 The third fun day on Barnards Park, Crow Lane was opened this year by the Lord Mayor and Lady Mayoress at midday on Saturday 30th August. They spent an hour walking around Barnards Park talking to local people and agencies. Once again the weather was good after such an awful summer. The road show was fantastic, which was provided by one of our resident’s son and made the fun day go with a swing. The inflatable gladiators arena proved challenging for some as did the inflatable human table football. 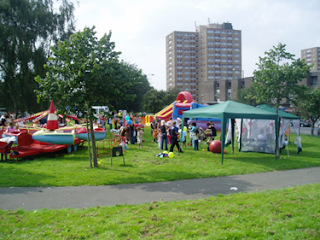 As well as the bouncy castle we also had a children’s roundabout and there were more stalls. We had an art & play workshop for children and young people, which was powered entirely by a bicycle and the circus entertainer also proved to be very popular as did the face painting. There ware not nearly enough wet sponges thrown at PCSO Abby Elliott-Taylor and PC Nick Merrick, so don’t be shy next year. Henbury Community Council and Events Group members raised over £600 on the raffle: well done! Thank you to the traders who donated prizes for the raffle. Also thank you to the volunteers of St John’s Ambulance who fortunately did not have to be called upon for first aid. Thank you to everyone who made the fun day a great success once again. Henbury Area Holiday Activities (HA-HA) offered a wide range of things to do this Summer across Henbury and Brentry including day trips all over the South West, from catching 20lb common carp and 16lb conger eels and climbing the highest mountain in the UK. The Big Idea Theatre School started the season, led by Debbie Stewart drama teacher at Henbury School. The week-long summer school was open to all to experience new things and make new friends. The week concluded with a show for parents and friends. Perhaps the most challenging activity had to be The Henbury School Trust Ben Nevis Challenge 2008. Departing early Tuesday 12th August, twenty students from Henbury School set off to Fort William, Scotland to take part in five days of trips to local sites of interest, playing team games in the evening, fishing for crabs from Loch Linnhe as well as the serious business of climbing Ben Nevis, the tallest mountain in the UK. Ben Nevis claims climber's and walker's lives every year but with the expert knowledge of Chuck and Guy our guides from Ice Mountain we made it to the top. It was only one of a handful of days this year that the summit had a 360° clear view of the breathtaking countryside below. Each student returned to the start, veteran of a monumental day, full of stories about the climb and all agreed that the experience would be hard to beat. Many thanks to all involved, to the participants and to the people who supported us through sponsorship. We are in the process of planning next year’s challenge which will be revealed in December. All too soon the summer came to an end, it’s back to school for another year. “We Music Kidz at Emmanuel Chapel would like to say a big thank-you to Ruth Moss for all the work she's put into the group for the last five years. The group provides music and fun for the under fives on Thursday mornings. Ruth often puts in a lot of extra work at home making foam figures and sorting out the songs. Join us on the FREE Parenting programme, “Strengthening Families, Strengthening Communities” (SFSC), a 13 weeks course which started on Nov 5th at Henbury Court Children’s Centre. This is a fantastic opportunity for parents to meet other parents in the community, to share experiences, learn and develop new skills/ideas to manage your child’s behaviour, find out which agencies can offer extra support, not feel alone and to have fun!! FREE crèche and breakfast provided. 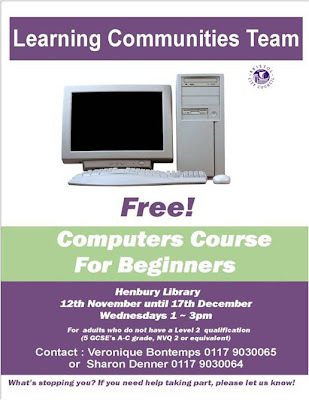 To find out more, please contact Emma Thomas 9030134 or Sue Hext 9030162 at Henbury School. How much do you know about Henbury & Brentry? Take part in our reminiscence quiz! Do you have any old photographs/newspaper cuttings/stories you would like to share? Join us for tea and a chat - and take a look at our photo archives, old maps and other historical documents. Want a bite sized book? Try one of our Quick Reads - short, exciting books by bestselling authors and celebrities for adults who are new to reading, have lost the reading habit, or who prefer a quick read. Quick Reads are both fiction and nonfiction and include the likes of Gordon Ramsay, Colin Jackson, Josephine Cox and a new Dr Who story. Not much of a reader? Start now with our Six Book Challenge in association with Costa Coffee. The Six Book Challenge invites people to read six books and record their reading in a diary in order to receive a certificate to celebrate their achievement - you'll also be entered into a prize draw! "I never thought I could read one book, never mind six! I feel so proud. I've never felt so good about myself. I feel like I can do anything now." Noleen Vine, 2008 Challenge completer, Warrington. Rockin' Babies every Monday 10.30 til 11 - Singing, rhyming, clap-along fun for babies and toddlers aged from 6 months to 2 1/2 years. Join in with stories and crafts every Tuesday 10 til 10.30 at our Pre-School story time and craft sessions. In Year 7? Want some Homework help? Come to our weekly Homework Club on Tuesdays 3.30 til 4.30 with free computer access and printing. We don't just read, we write too! The 7-11's monthly story group meets on the 3rd Saturday at 11.30 every month. Each month we have a theme; sometimes we work together or separately and we also use the computers. Even better we have our own special 'soap' set in Henbury and we add to the story each meeting. We have even produced a book of fantastic adventures. Come and join us if you have a story to tell. 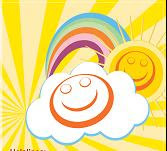 Henbury Area Holiday Activities (HA-HA) is a holiday play and activity scheme for children in Henbury and Brentry. It has been operating successfully since 1994, and boasts a strong balance sheet and meets all it's obligations to Ofsted. It provides creative play through dedicated professional play workers, with strong policies in place to ensure the safety of participants. HA-HA aims to pay salaries to workers comparable to or better than similar schemes across the city. Currently, there are vacancies on the management committee for a Chair, Secretary and Treasurer. The current post holders are senior citizens who feel it is time to step aside and allow a younger generation to provide fresh impetus. 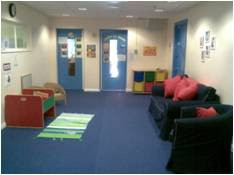 The jobs involve 3 or 4 meetings a year with oversight of the scheme during the school holidays. If you can help this important local resource, please contact Maddy Powell on 9836819 or Richard Pyle 9504000. We opened on the 6th October. On our opening day, we were delighted to welcome many families and visitors from the local community. We are providing a range of day care and community groups (see page 7 for weekly programme) for families with children under 5’s. Do call in or give us a ring Jane, Claire or Sara on 0117 353 4479 if you would like more information. Both Avon and Somerset Constabulary and Bristol City Council frequently receive calls from residents expressing concern about persons riding mini-motorcycles and go-peds in public places around Henbury and Brentry. Mini-motos are becoming increasingly popular but many parents are unaware of how dangerous these bikes can be and what laws are in place to safeguard their use. Children as young as 5 years old are riding them with no instruction, protective clothing or helmets and sometimes with little or no adult supervision. • These bikes can only be ridden on private land with the express permission of the land-owners. • They can be dangerous for both the rider and any pedestrians that may get in the way. • It is inconsiderate and aggravating for others when they are ridden in unsuitable locations. • Elderly people and young children or animals may be unable to get out of the way in time and could easily be hit by one of these bikes which can travel at speed. • The consequences could be great for all concerned and the rider could not only face civil proceedings for damages but fall foul of the Road Traffic Law. To make it clear here is a simple guide about what they can and cannot do if they ride these small motorcycles anywhere that is not private land. • The rider must wear protective helmet and eyewear. 'Any place to which the public have open access is a public place, even if payment must be made to gain entry'. This would include car parks (public, retail and business parks), public parks, recreation grounds and open spaces. Bikes can ONLY be ridden on private property with the owner's consent. Section 34 of the Road Traffic Act 1988 states that, if without lawful authority a person drives a mechanically propelled vehicle on to or upon any common land, moor land or land of any other description, not being land forming part of a road, or on any road being a footpath or bridleway or restricted byway he is guilty of an offence. Both police constables and PCSOs have powers to seize any vehicle used in a manner which causes alarm, distress or annoyance under Section 59 of the Police Reform Act 2002. If parents are the owners of a motorcycle, it can be classed as 'aiding and abetting' if they permit the illegal use of a motorcycle. Even if a parent just buys petrol for a motorcycle they then allow to be ridden illegally, they could be aiding and abetting the rider to commit offences. Owners can be prosecuted in addition to riders. Go-peds - what's the law? Go-peds, citybugs, buzz-boards and motorised skateboards are the most recent noisy additions to our streets and open spaces. However, most riders are unaware of the laws relating to their use. Go-peds should not be sold as being suitable for use on the road, and people selling them should make buyers aware of the legal requirements. If they are used in a public place, they are considered to be a mechanically propelled vehicle, and subject to the same laws as motorcycles. To use a go-ped legally in a public place, you must follow all of the 'Ride legal' rules that apply to motorcycles. Go-peds may be used in private gardens or on land where the rider has been given permission by the landowner. If you have concerns about these bikes being ridden on public land please report it to the Police on 0845 456 7000 providing as much detail as you can (time, location, number, etc) and as often as it occurs. Since the beginning of the year Avonmouth Beat Team have seized 19 mini motor bikes, motor bikes and cars for no insurance and under Section 59 of the Police Reform Act 2002. Virtually all of these have been crushed. Officers have also issued 11 Section 59 warnings to person(s) riding or driving vehicles carelessly, inconsiderately or off road. 1. Windows - in just under one third (30%) of burglaries with entry, the thief gained access through an unlocked door or open window, so ensure they are locked particularly when leaving the house. 2. Lighting - leave a light on to give the impression there is someone at home. 58% of burglaries take place after dark and 34% occur at the weekend. Use time switches to operate radios and lights when you are out. 3. Burglar Alarms - visible burglar alarms make burglars think twice. Those connected to a monitoring service are the best, get specialist advice and several quotes. 4. Keys - never leave a spare key in a convenient hiding place like under the doormat or in a flowerpot - a thief will look there first. If you've moved house, consider changing the locks as other people may have keys. Never leave keys near a window or door - thieves use a hook or magnet on a stick pushed through the letterbox to take car keys so they can steal cars. 5. Secure all doors - Thieves are most likely to target doors when attempting to break in (67%). Check the condition of the frames, hinges and glass panels. Fit such devices as chains and door viewers. Patio doors will also need special fitted locks. 6. Garages and Sheds - are often left unlocked and may be full of tools and ladders ideal for breaking into the rest of the house. Fit sheds and garages with strong padlocks and ideally an alarm. 7. Postcode your property - marked property can deter burglars because it is harder for a thief to sell on and may also help police secure a conviction. 8. Good Neighbours - if you see anyone acting suspiciously in your neighbourhood, call the police. Get in touch with your local Neighbourhood Watch scheme or form a new one in your area - see what they're doing and how you can contribute. 9. Bogus callers - Most people who call at your home will be genuine, but sometimes people call with the intention of tricking their way into your home, distracting you and stealing money or valuables. Follow the "Lock, Stop, Chain, Check" method. If you are unsure about the person at the door, do not let them in. 10. Insurance - insurance will relieve you of the financial worry of replacing stolen goods and many insurance companies offer reduced premiums for people with good home security. 11. Stolen Goods - do not buy goods that you think might have been stolen as it encourages people to commit acquisitive crime, often to fund a drug addiction and a local drug dealer. Criminals take the opportunities afforded them by the extra shopping we do, the hustle and bustle of town centres as we rush around and the value of the goods we buy as presents and store in our homes until the big day. We might also be more trusting and generous at Christmas when requests for charity are made, giving the unscrupulous a chance to collect for their own causes. r body and ensure your chequebook and guarantee card are separate. If you have too many bags you will be too busy trying to hold on to them to be aware of anyone stealing from you. Make smaller shopping trips rather than do it all at once and carry too much. The same applies to travelling on crowded buses or trains. If you travel by car, make sure you park in a well- lit area, lock all doors and windows and do not leave presents in view. Try not to return to your car to leave purchases in the boot before continuing with your shopping as thieves may well watch car parks for just such a chance. Arrange to collect heavy items from stores when you have finished all your shopping. 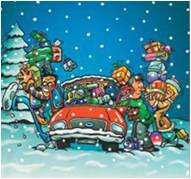 Having bought all those wonderful presents, don't make it easy for someone to steal from your home. Keep them out of sight until last thing on Christmas Eve and if you 'hide' or store larger items such as bicycles in the shed or outbuildings, make sure they are very secure. You may well find you need to check your insurance to make sure you are covered for the extra value of goods in your home. Take the frame numbers of new cycles and the serial numbers of new electrical equipment for future reference. Remember, empty boxes left outside advertise that you have new goods inside - dispose of packing carefully. “A new vaccination giving protection from cervical cancer is being offered for the first time to thousands of young women across Bristol, South Gloucestershire and North Somerset. Cervical cancer is caused by a virus called Human Papilloma virus, or HPV. It is the second most common cancer of women worldwide and with over 3,000 women affected each year in the UK, with about 1000 deaths. The HPV vaccine protects against 70 per cent of all cervical cancer cases. This is the first time the vaccine has been made available in this country; it has already been used successfully in over 90 countries around the world, including America, Australia and Germany. From October, the HPV vaccine is being routinely offered to all young women aged between 12 - 13 and 17 – 18 year olds in Bristol, South Gloucestershire and North Somerset. A course of three doses of vaccine is necessary for protection and these will be given over a six month period. Dr Angela Raffle, consultant in public health for Avon area, and national expert on cancer prevention, said: “The HPV vaccine is a safe vaccine. It is an important development in our efforts to reduce the risk of cervical cancer. A good immunisation programme, reaching all the eligible girls, will complement our Cervical Screening Programme. The vaccine can only give immunity to some sub-types of HPV, therefore regular cervical screening will remain vital. For more information please contact: Sue Pratt, communications manager South Gloucestershire PCT, on 0117 330 2499 (mobile: 07502 184 701). The HPV vaccination is licensed for use to reduce risk of cervical cancer, but only in addition to cervical screening. It is essential that vaccinated girls participate in the cervical screening programme once they reach age 25. The Joint Committee on Vaccination and Immunization (JCVI) provides the Department of Health with independent expert advice on all vaccine issues.Human Papilloma viruses cause 99 per cent of invasive cervical cancer. To ensure maximum benefit and protection from this vaccine, it is necessary to administer it before the onset of sexual activity. The vaccine protects against the viruses responsible for about 70 per cent of cases. Cervical screening substantially reduces the risk of developing cervical cancer. It prevents around 7-8 cases out of every ten in regularly-screened women. For more information about cervical cancer and the screening programme see: http://www.cancerscreening.nhs.uk/cervical/index.html. An hour and a half a week could change your life. The Freedom Programme is a 12-week support group for women who would like to know more about the realities of Domestic Abuse. The programme aims to help women gain confidence and self esteem to improve the quality of their lives. Freedom programmes are being run from venues across Bristol and all groups are open to women from any area and are free. If you would like to find out more about the programme and where your nearest group is then contact the BDAF Administrator on 0117 9142232. Saturday 23rd August saw a group of fifteen of us leave Henbury and the soggy British summer to head for Heathrow and our flight to Amman in the Hashimite Kingdom of Jordan. There was a definite buzz of excitement from the whole group but especially from a few novice travellers for whom the chance to experience a completely different culture was something dreams were made of. We started well by having a hotel upgrade to five star for our first night. Not much time to rest though as the tour started with a visit to the Roman city of Jerash. Amazingly well preserved, it did not take much imagination to picture life during the Roman period. We even witnessed some chariot racing and had a demonstration of gladiator warfare inside the original amphitheatre. We were then granted some time to chill out and get over our flight and acclimatise to 34o degree heat by soaking up the rays overlooking the Dead Sea by our hotel pool. This is the lowest point on earth and the salt content in the sea means you cannot sink, so even the non-swimmers ventured out for a paddle and a covering of therapeutic mud. Next up was a visit to Petra. We arrived at the siq by horse, all feeling somewhat like Indiana Jones. The three quarter mile long siq is a steep gorge that takes you into the Red Rock City. You can spend a few days here exploring the tombs, caves, monasteries, treasures, altars etc all carved into the natural sandstone rock some 2000 years ago. Keeping the desert theme, next stop was Wadi Rum, an area of outstanding natural beauty near the borders of Saudi Arabia and Egypt, made famous by Lawrence of Arabia as he helped fight the Turks in 1917. Here we took 4x4 jeeps into the desert to a Bedouin tent for some tea and just to experience the desert air in our hair. This prepared us for our next adventure which was a two-hour camel ride into the sunset. Stunning. That night we actually slept in tents, or under the stars as some chose to do and awoke in time to see the sun rise. 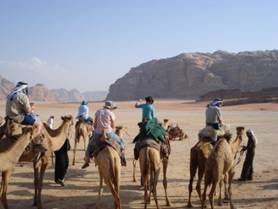 Jordan is also the place where many famous biblical events like the Exodus took place and many of the Old Testament characters like Samuel, David, Moses and Elijah lived so for some in the group added an extra dimension to the holiday as it brought the Bible alive. We then had to negotiate one of the most disorganised border crossings in the world as we crossed the Allenby Bridge into Israel for two days of exploring Jerusalem. Visiting the old city and seeing many of the places Jesus lived, and indeed His place of execution and resurrection was thought provoking whatever faith, or none you held. Next trip we are leaving for Dubai. See events page for details. 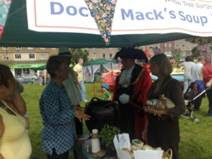 Many of you will have visited our soup and snack stall at the highly successful Henbury Fun day in August (photo) – we chose to make soup because it is one of the healthiest meals you can eat, whether it’s for lunch, supper or simply a snack. It makes a wholesome meal any time of year but it’s especially welcome as the weather gets colder….Homemade soup is best of all. It’s economical and simple to make and can be a good way to use up leftovers. And you can always freeze some for another day.Here is our basic formula (some might even call it a recipe!) for cooking up a delicious tomato and vegetable soup – just add what’s available in season in the shops or in your garden, or whatever happens to be in your cupboard or fridge, plus a little of your own imagination. To make it a complete meal – add a handful of red lentils or a tin of beans (excellent cheap protein that’s also good for your heart) or tinned sweet corn. Bring to the boil, then simmer and stir occasionally for about 15–20 minutes until the vegetables are soft. Whizz it up with a hand whisk if you like a smooth soup or want to drink it from a mug. Or leave it chunky and eat with a spoon. You can top your soup with grated cheese, or stir in some plain yoghurt. Or add chopped fresh herbs – parsley, basil or thyme. Or float some croutons made from stale bread dipped in olive oil and toasted in the oven for 5 -10 mins. Enjoy with some chunky wholemeal bread and a salad for the healthiest meal of all! To empower residents to take ownership by involving all members of the community to help make Henbury and Brentry a safe and pleasant area to work, live and play, by working in partnership. To prevent and reduce crime and anti-social behaviour, to improve effective communication, to reduce the fear of crime, to increase pride to improve the local environmentto improve the health and well being of the community. PACT (Partners and Communities Together), which aims to identify specific issues to be prioritised for action for the following 2 months. The priorities (usually 3 or 4) will be agreed by the relevant agencies and residents. Updates on progress/action taken will be reported back at the next PACT meeting. Purchased a mosquito for Henbury and Brentry as the Police device was short term only. The mosquito will be sited at “The Local” off licence as soon as PC Andy Stamp has made a metal cage to protect it from being vandalised. Issues of graffiti, rubbish, litter and fly tipping are on the increase, but all of these are dealt with when identified on “Walkabouts”. Please contact Cheryl Coles, Community Safety Officer for further details on 07810506846. The Henbury and Brentry SEARCH Group would like to thank the young people who entertained us at Henbury School on Friday 1st August. Also thank you to Nick and all the staff involved. The array of food prepared and laid out for us was delicious and served with a smile. The performance that followed was very enjoyable and extremely well done. The cast should be proud of themselves. We would also like to thank those youngsters who gave us guided tours of the Arts facilities at the school—many of us had never been inside the new building. The standard of work on show proves that Henbury School has many talented pupils. We all thoroughly enjoyed the whole afternoon and applaud all those concerned for the hard work and commitment it must have entailed. Thank you all again for inviting us. We look forward to visiting the school again in the future. Since our last issue, a lot has happened in our area and we'd love to hear what you think. Please email us or call us. Feedback from our last issue was largely very positive again, but if you disagree - you know what to do! Anna has now moved to Devon and we wish her and her family well in their new community. 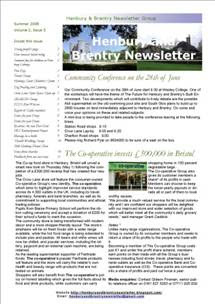 "I live in Henbury and I am quite disappointed to find out there has been a meeting at Wesley college on the 28th June, as I didn't receive notice of this meeting until 29th June and I suspect a lot of people didn't get their Henbury and Brentry newsletter until then. What was the point of the meeting if we don't know about it? I feel our opinions were not wanted or we would have had proper notice of this meeting, but of course it’s now too late." - One very Annoyed Resident of Henbury. We are sorry that the last newsletter was delayed by two weeks, and as we mentioned on the feedback page, it was due to technological issues beyond our control. We feel it important to clarify that this newsletter is run by volunteers and in no way represents either the Community Council or Bristol City Council, although members of both participate and help to fund its production. Also, as passionate members of the community, we more than most welcome your comments and opinion on developments in Henbury and Brentry. We recognise the importance of dialogue between individuals, public bodies and private enterprise and want the newsletter to act as a forum for it. LASTLY, THIS FURTHER HIGHLIGHTS OUR CONSTANT REQUIREMENT FOR MORE DELIVERY VOLUNTEERS! ALL WELCOME, NO MATTER HOW SMALL AN AREA YOU CAN COVER! or call the editors: Marianna 0117 950 7032 and Olivia 0117 950 0936. A husband and wife team (Mark and Marie Davies) who have moved into Henbury, opened a shop after ten years working from their home in Lockleaze. The shop sells a wide range of walking frames, scooters and home comfort aids from the new premises, at very competitive prices. 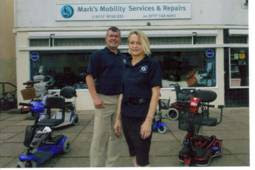 They also service & repair mobility products. They have received a positive support from clients old and new for the shop. Existing clients of the firm include The Mall at Cribbs Causeway and Bristol Zoo, both have been supplied with mobility scooters for use on site by their customers, which they also maintain. They also have clients as far away as Cardiff, Newport, Cheddar and Weston. 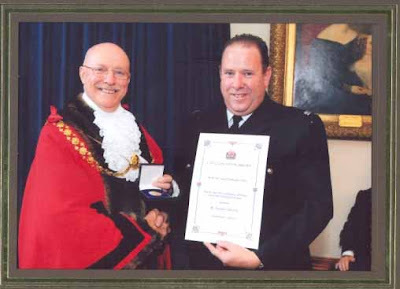 The Lord Mayor presented PC Nick Merrick with Lord Mayor’s Medal at Mansion House on 18th September. The Medal is presented to people who have made a significant contribution to the life of Bristol. PC Nick Merrick has worked in Henbury for 12 years. His work as a Policemen has of course, been exemplary, but this award is about the community work he has done, over and above that, in his spare time. He has worked tirelessly with Henbury and Brentry Community Council and other bodies in the ward, especially with young people, helping many who would otherwise have strayed into undesirable activities, and reaching out to those who the community consider a problem. He has organised many events designed to integrate young people with older residents, such as community Fun Days. He has been very involved with the “Christmas Crackers” event on Crow Lane during the Festive Season which is fast becoming a local tradition. 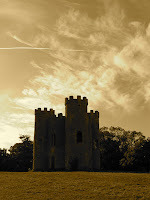 He also organises residential adventure weekends away for young people. On many of his projects he is assisted by his wife, and his children come along too. The Henbury and Brentry Community is hugely in his debt. He does not live in Henbury, but his selfless commitment to us is second to none. Are you frustrated by public transport? Fed up with traffic jams? Would you like to be able to use a local train service to get to Temple Meads station, or out to Portishead? This is an important time for Bristol decision-makers in transport policy, as the regional funding allocation for transport will be decided in February 2009. The Friends of Surburban Bristol Railways have launched a campaign for the re-opening of the Portishead and Henbury passenger lines as part of the Bristol network, and are distributing postcards to be sent to key individuals. If you would like to see a Henbury train service, please write to your councillors Derek Pickup derek.pickup@bristol.gov.uk and Mark Weston mark.weston@bristol.gov.uk and your MP Doug Naysmith naysmithd@parliament.uk If you could help give out post cards or are interested in joining the Friends of Suburban Bristol Railways campaign, contact Julie Boston T 0117 942 8637 or email severnbeach@hotmail.co.uk.